Pancham in game: 4,337 Who? Important notice! Pokemon Pancham is a fictional character of humans. 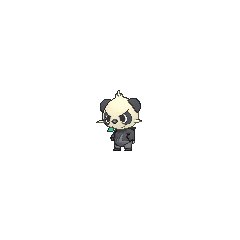 Pancham (Japanese: ????? Yancham) is a Fighting-type Pokémon introduced in Generation VI. 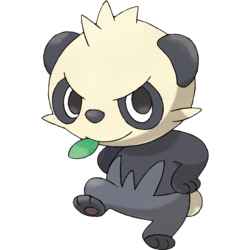 Pancham is a mammalian, bipedal Pokémon that resembles a young panda. Its head and short, puffy tail are white. There are tufts of fur on top of its head and on its cheeks. There are black circles around its eyes, and the ears are also black. The upper body and hind feet are black, while the lower body is a dark gray. It has dark brown eyes with no visible irises. There are small, dark brown circular pads on the soles of its three-toed feet. It carries a small, green leaf in its mouth. Pancham tries to make itself serious towards its foes, but its glare is not so intimidating. If patted on the head, it can't help grinning. In Dreaming a Performer's Dream!, Serena captured a Pancham. Two Pancham made a debut appearance in The Bamboozling Forest!. A Pancham appeared in Heroes - Friends and Faux Alike!, under the ownership of Myron. A Pancham appeared in Diancie — Princess of the Diamond Domain. A Pancham appeared as a silhouette in Dreaming a Performer's Dream!. A Pancham appears with its trainer, a female Preschooler, at the Mini-game Corner in the X & Y chapter. Pancham is one of only two Pokémon whose ability to evolve depends on having another Pokémon in the party. (The other is Mantyke, who can only evolve when a Remoraid is present in the party.) Pancham can evolve if a non-Dark-type Pokémon evolves into a Dark-type Pokémon (such as Eevee to Umbreon), but only if it is in a party position before Pancham (i.e. Pancham evolves last). Pokémon that can become Dark-type only while in battle (due to Mega Evolution, or a type-changing move or Ability) cannot cause Pancham to evolve. Pancham is the lightest Fighting-type Pokémon. Yancham may come from ???? yancha (naughty) and champion.